Client's Request: My Bougainvillea is five years old, but it has never bloomed. What should I do? MGCC Help Desk Response: Thank you for contacting the UC Master Gardener Program Help Desk with your question about your non-blooming Bougainvillea. Based on the fact that your plant is five years old and hasn't bloomed, we find there are a few things to consider. First, the Sunset Western Garden Book says that these vines need to be planted on a protected warm wall or the warmest spot in the garden. If they get by the first winter or two, they will be big enough to take most winter damage and recover. They do need full sun and the definition of “Full Sun” is at least six hours of sun per day. We think you may need to consider carefully relocating your plant to a sunnier area for better bloom results, or you might also consider transferring your plant to a large pot and locating it in a protected yet sunny location on a patio. Bougainvillea do not like to be moved, so if you decide to do this, make sure to dig out as much of the root ball as you can in order to lessen root disturbance. Second, for great color and abundant blossoms, it is recommended that you feed your plant. According to our research, hibiscus or Bougainvillea food are a good choice for Bougainvillea because of the inclusion of iron and other micro-nutrients these plants need. If you use other types of fertilizer, read your fertilizer label and make sure that the first number is lower (nitrogen amount) and follow the directions for application. The (higher) nitrogen content of the fertilizer you use may be what is causing your vibrant flush of green leaves and no flowers! 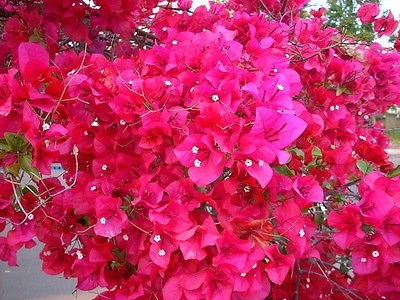 Third, Bougainvillea are drought tolerant once they are established. However, they like to be watered deeply and then allowed to dry out. They do not like wet soil, so drainage is important whether you plant them in the ground or in a pot. If you plant in a pot, do not use a saucer or water dish. Too much water or waterlogged roots can cause bracts to drop, or your plant to stop blooming completely. Finally, Bougainvillea bloom on new wood so pruning and pinching are important. Pruning can be done at any time of the year, and is used to shape the plant. Bougainvillea can be pruned hard to restrict growth, and stems can be pruned to create branching. Shaping your plant depends on if you want it to grow aggressively for a hedge, or vertically to cover a trellis, or want it to be full, bushy and overflowing for a pot. Pinching is also important. Pinching is the method of removing the soft, growing tips of young plant stems to encourage fuller growth. The more you pinch, the more your bougainvillea will branch and bloom, so prune and pinch after a flowering cycle has completed. One cultivar that many gardeners are able to grow successfully in Contra Costa County partly due to its frost hardiness: Bougainvillea 'San Diego Red' is evergreen and grows to 15–30' tall. ‘San Diego Red' is one of the most cold-tolerant Bougainvillea available with lipstick-red bracts. It is known for its ability to cope with the occasional freeze; it has been noted as hardy down to 20°F. Good luck with getting your Bougainvillea to bloom! These lovely plants are definitely worth the effort to grow! Mark your calendars now! Our popular Fall for Plants gardening workshop will be returning to Walnut Creek on Saturday, September 8. For more information, visit the event main page and the workshop program page.